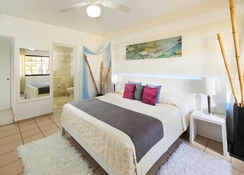 Occupying a stunning seafront location, the adults-only BlueBay Villas Doradas is built amid thick greens, and surrounded by water on one side and a hill on the other. Situated on the white sandy Playa Dorada beach and next to a huge 18-hole golf course, the hotel accommodates 245 luxurious rooms and suites. The beautiful landscape view is enhanced by three pools that are fitted with white sunbeds and parasols, where guests can enjoy the tropical Caribbean climate. Apart from the on-site pools and the private beach, the hotel also offers world class spa facilities with relaxing and revitalizing treatments to pamper guests. There are four restaurants in the hotel that prepare some of the finest local food in Puerto Plata as well as a range of cuisines across the world. To stay in shape during holidays, work out at the fitness centre or take advantage of the numerous sporting opportunities that include tennis basketball, snorkelling and kayaking provided at the hotel. 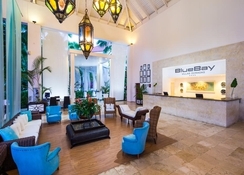 One of the best hotels in the Dominican Republic, the BlueBay Villas Doradas is conveniently located on the Playa Dorada beach and is at a two-minute walk from white sands and crystal-clear waters. 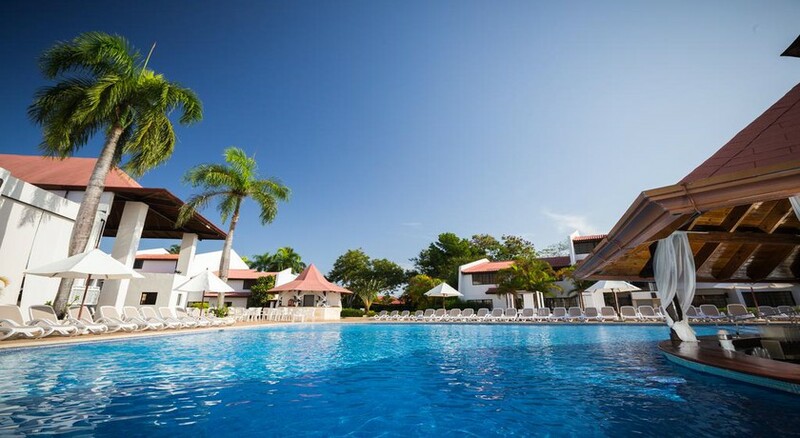 The hotel lies next to the 18-hole Playa Dorada golf course that is renowned for hosting international tournaments. The Playa Dorada shopping centre is only a 10-minute walk from the hotel and the Puerto Plata town centre is 6.2km away. The resort of Punta Cana takes about 7 hours by car and the nearest airport from the hotel is La Union Airport at 15km. 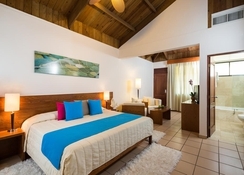 BlueBay Villas Doradas houses 245 rooms and villas, each pleasantly decked out in colonial style. The rooms are spacious, adorned with luxurious fittings and a balcony or terrace, which affords scenic views. Guests can choose from five categories of rooms –Standard Room, Superior Room, Silver Room, Gold Room and Platinum Room. Each room comprises of a king-size bed or two queen-size beds, air conditioning, TV with satellite, tea/coffee service, hairdryer, electronic safe (extra charge), Wi-Fi (extra charge), en-suite bathroom, fridge, mini bar and welcome kit. Guests of the BlueBay Villas Doradas can choose from four on-site restaurants that offer some of the finest Dominican Republic food in Puerto Plata. 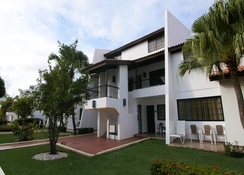 The hotel’s international buffet-restaurant, Las Garzas, serves breakfast, lunch and dinner. In addition, there are three la carte restaurants, offering oriental fusion fare, seafood and grilled meat. 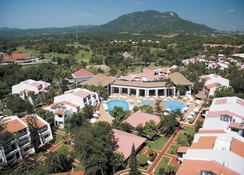 Apart from the restaurants, the hotel also houses a pool bar and a snack bar to enjoy drinks and light snacks. The Black & White bar boasts a large selection of premium beverages. In case guests want to explore the eateries in the neighbourhood, there is a plaza just 100 metres away from the hotel. Apart from being set on a picturesque private white sandy beach with crystal-clear waters, the resort offers a range of entertaining activities to help its guests make the most of their holiday. The resort boasts three swimming pools lined with loungers, making it a great place to spend days relaxing under the sun. For the active guests, the resort houses a fitness centre and provides a number of sporting opportunities that include tennis basketball, snorkelling, kayaking and much more. A bicycle hire facility is also available, which is a great way to explore the islands stunning scenery in a different light. For some extra indulgence, guests can pay a visit to the spa where a number of massages and treatments are offered to rejuvenate the mind, body and soul. Couples can also take classes in cocktail making, sushi making, dance and massage.